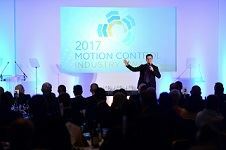 The 2017 Motion Control Industry Awards were recently announced at a gala awards ceremony. Technical Innovation of the Year was won by JCB Hydradig, the Environmental/Efficiency award was given to Gardner Denver for its Triple ROBOX Energy Screw Compressor, the Project of the Year was won by Bosch Rexroth for its Offshore Wind Farm Piling Template, Manufacturer of the Year was ABB and the award for contribution to Skills & Training went to the Bosch Rexroth Challenge. There were three other awards: Engineer of the Year, which was won by Graham Fick of Zikodrive Motor Controllers and two Lifetime Contribution awards which went to Derek Turnbull MBE and Gary Wyles.